An illicit network of workshops manufacture and sell clap-nets that are fueling rampant poaching. Poaching is a major threat to some species of birds in China, and it’s abetted in part by a network of factories and workshops that produce clap-nets. A clap-net is a net made from fine threads, usually nylon or plastic. Typically, the nets are draped over bamboo poles or hung from tree branches. When birds fly into them they get stuck in the mesh, making it hard to escape. There are two main kinds of bird nets: anti-bird nets, which farmers use to cordon off certain areas to prevent access to crops by birds; and the more harmful clap-nets commonly used by poachers. Birds captured in clap-nets are usually sold on by the poachers to restaurants and individuals for consumption. 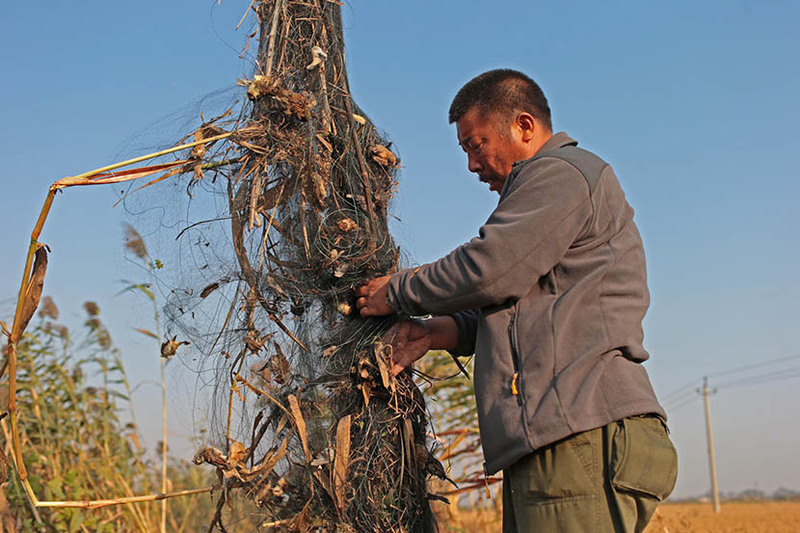 China’s national and local laws and regulations ban the use of poaching tools, but it’s not clear if the manufacture and trading of clap-nets is illegal, as most regulations only mention guns and poison. Nine provinces in China ban the use of clap-nets, but only Jilin province has outlawed their manufacture and trade too. Poachers generally wait for several birds to become ensnared before closing the nets and collecting their prize. The trapped birds often die from hunger or thirst, and the filaments cut them and tear off feathers as they struggle. 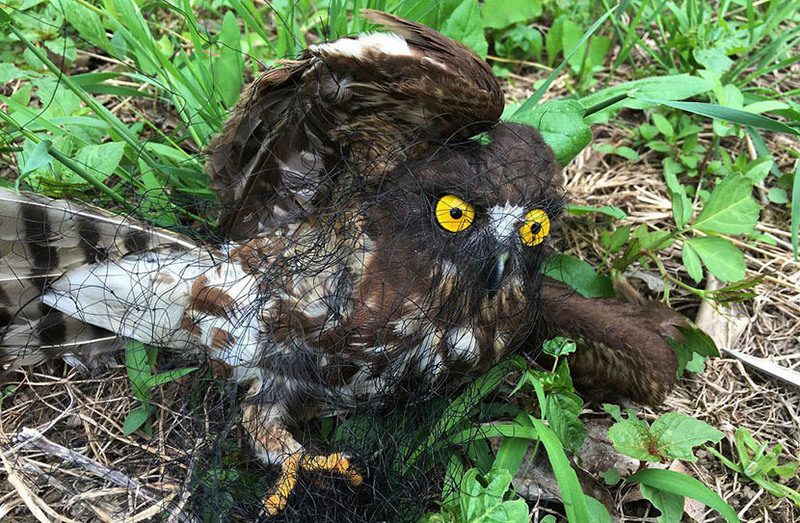 It’s critical for conservationists to find clap-nets hidden in forests before the trapped birds die from hunger or are collected by poachers. Experts and environmentalists say it’s urgent that China set up a stricter protection law for wild animals. They condemn clap-nets specifically for being cruel and inhumane, and they have accused government departments of ignoring the issue. Chinese authorities are currently drafting a new law which will ban a wider range of poaching tools. A 2012 study by Ma Ming of the Xinjiang Institute of Ecology and Geography estimated that 200,000 water birds were poached in China between 2010 and 2012. In addition to clap-nets, poachers also used methods and tools such as poison, guns, and crossbows to catch the birds. Because of their negative associations, clap-nets are largely produced and sold in clandestine ways. The Chinese environmental foundation Let Migratory Birds Fly (LMBF) traces the beginning of the clap-net trade to Wudi, where hundreds of small businesses are now producing them. Wudi County, in eastern China’s Shandong province, lies in the Yellow River delta, and it has been known as a hub for producing fishing nets for decades. As demand for clap-nets increased, more businesses in Wudi have branched out from fish nets to bird nets. Earlier this month, Sixth Tone traveled to Wudi, posing as a potential clap-net buyer. As making and selling clap-nets is an open secret in the town, it wasn’t hard to locate the factories by asking around in the villages. Sixth Tone visited Wenyao Net Factory, in a rural area 15 kilometers north of Wudi. The owner, Wen Xinhai, is in his early 30s. He worked for other net factories for three years before launching his own enterprise two years ago. As Sixth Tone arrived, Wen was preparing a large bag of clap-nets for a customer. He opened a notebook with records of all the factory’s transactions, as well as all the places his nets had been shipped. Wen’s “factory” is in a white two-story house near the main entrance of a village in Wudi. On the first floor there are two machines that weave the wire netting. Wen and his family live on the second floor. Wen employs six people who work in shifts in order to make the most efficient use of the machines. Clap-nets are cheap and easily obtainable. In Wudi, you can buy one for 5 yuan — less than a dollar. 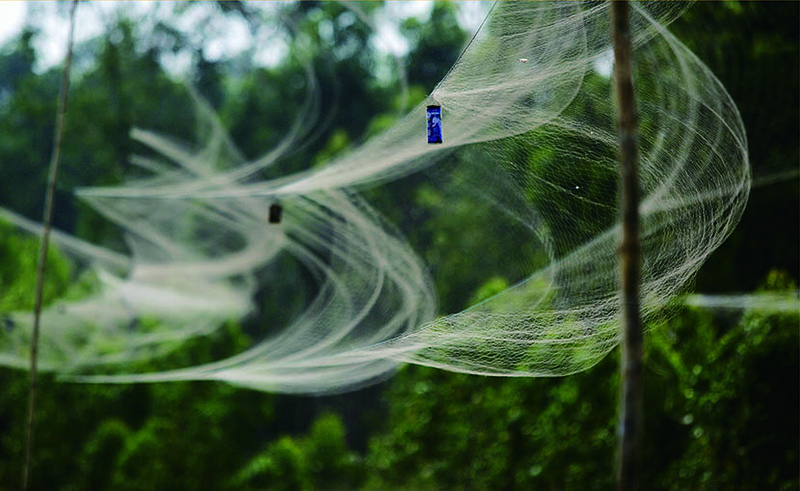 One net, sold for such a small price, can be used to catch more than a hundred birds in one day. Clap-nets are also for sale on websites such as Alibaba’s Taobao marketplace. Searching “clap-nets,” or “buniaowang” in Chinese, yields no results. The website shows this keyword isn’t available, but when the words are altered slightly, hundreds of results show up. Liu Xiaojie, a public relations representative for Alibaba, said the company strongly opposes the sale of such products on its websites and has taken steps to devise technological filters to stop clap-nets from popping up. The company also encourages users to report instances of these tools making it through search filters. Since many family-run businesses in Wudi don’t register with local authorities, it’s hard to estimate how many factories there are. An online search revealed 86 registered net-making companies in Wudi. But according to Wudi residents, there are actually a few hundred machines owned by a few hundred small businesses. Qi Yuting, a program officer for LMBF, recommends that farmers use anti-bird netting rather than clap-nets, as the designs and material are different. Anti-bird nets, for example, aren’t as likely to ensnare and harm birds. But on their patrols through the forest, LMBF volunteers often find clap-nets set up by farmers and poachers. “If they’re using clap-nets, their intention, clearly, is to catch birds,” said Qi. 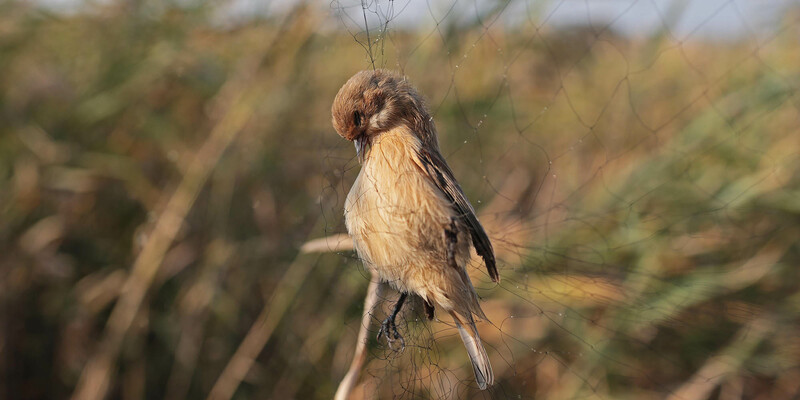 All of the net producers Sixth Tone spoke with were aware that catching birds often violates China’s environmental laws and could even constitute criminal behavior. Consequently, when sellers speak to potential customers about clap-nets, they do so with great caution. When asked if they knew the nets can kill birds, everyone Sixth Tone spoke with said yes. In an interview with Wudi authorities, neither the forestry bureau nor the bureau of industry and commerce said they were aware of the situation surrounding clap-nets.